The surface of Mars was once wet, but no water flows there now. UC San Diego chemists and others took a close look at meteorite that may have been blasted from this huge rift across the planet’s surface. The image is a composite of hundreds of photos taken by NASA’s Viking missions in the 1970s. Credit: USGS, NASA. A new analysis of a Martian rock that meteorite hunters plucked from an Antarctic ice field 30 years ago this month reveals a record of the planet’s climate billions of years ago, back when water likely washed across its surface and any life that ever formed there might have emerged. Scientists from the University of California, San Diego, NASA and the Smithsonian Institution report detailed measurements of minerals within the meteorite in the early online edition of the Proceedings of the National Academy of Sciences this week. “Minerals within the meteorite hold a snapshot of the planet’s ancient chemistry, of interactions between water and atmosphere,” said Robina Shaheen, a project scientist at UC San Diego and the lead author of the report. The unlovely stone, which fell to Earth 13 thousand years ago, looked a lot like a potato and has quite a history. Designated ALH84001, it is the oldest meteorite we have from Mars, a chunk of solidified magma from a volcano that erupted four billion years ago. Since then something liquid, probably water, seeped through pores in the rock and deposited globules of carbonates and other minerals. 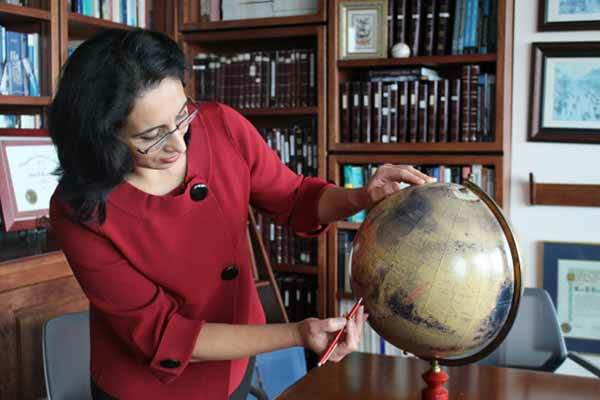 Robina Shaheen searches a globe of Mars for the likely origin of the Mars rock she and colleagues analyzed for traces left by the planet’s early climate. Credit: Susan Brown, UC San Diego. The carbonates vary subtly depending on the sources of their carbon and oxygen atoms. Both carbon and oxygen occur in heavier and lighter versions, or isotopes. The relative abundances of isotopes forms a chemical signature that careful analysis and sensitive measurements can uncover. Mars’s atmosphere is mostly carbon dioxide but contains some ozone. The balance of oxygen isotopes within ozone are strikingly weird with enrichment of heavy isotopes through a physical chemical phenomenon first described by co-author Mark Thiemens, a professor of chemistry at UC San Diego, and colleagues 25 years ago. “When ozone reacts with carbon dioxide in the atmosphere, it transfers its isotopic weirdness to the new molecule,” said Shaheen, who investigated this process of oxygen isotope exchange as a graduate student at the University of Heidelberg in Germany. When carbon dioxide reacts with water to make carbonates, the isotopic signature continues to be preserved. The degree of isotopic weirdness in the carbonates reflects how much water and ozone was present when they formed. It’s a record of climate 3.9 billion years ago, locked in a stable mineral. The more water, the smaller the weird ozone signal. This team measured a pronounced ozone signal in the carbonates within the meteorite, suggesting that although Mars had water back then, vast oceans were unlikely. Instead, the early Martian landscape probably held smaller seas. ALH84001 held tiny tubes of carbonate that some scientists saw as potential evidence of microbial life, though a biological origin for the structures has been discounted. On December 16, NASA announced another potential whiff of Martian life in the form of methane sniffed by the rover Curiosity. Carbonates can be deposited by living things that scavenge the minerals to build their skeletons, but that is not the case for the minerals measured by this team. By measuring the isotopes in multiple ways, the chemists found carbonates depleted in carbon-13 and enriched in oxygen-18. That is, Mars’s atmosphere in this era, a period of great bombardment, had much less carbon-13 than it does today. 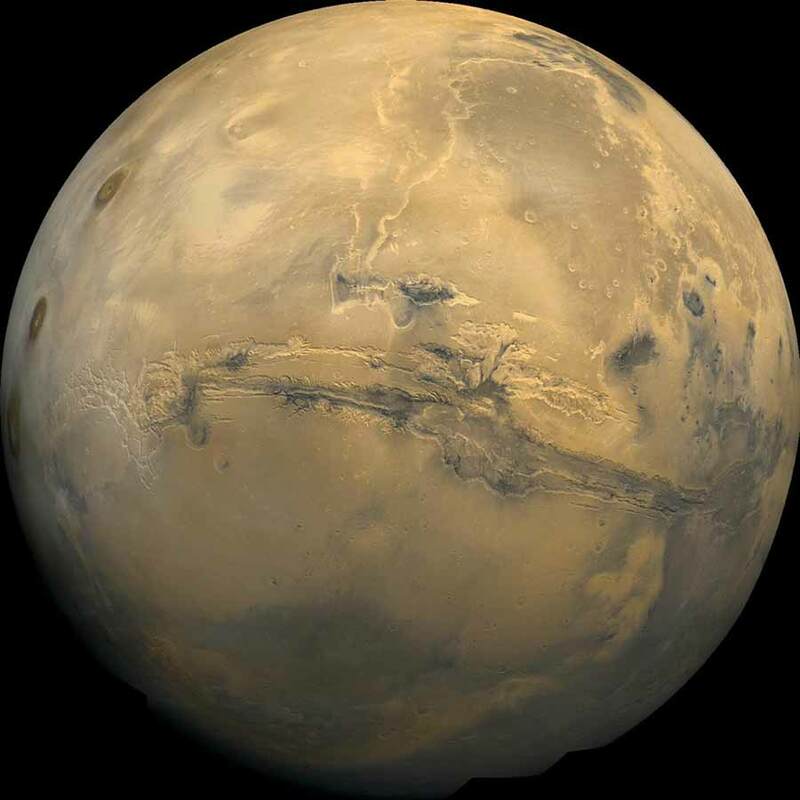 The change in relative abundances of carbon and oxygen isotopes may have occurred through extensive loss of Martian atmosphere. A thicker atmosphere would likely have been required for liquid water to flow on the planet’s chilly surface. Planetary scientists Paul Niles of NASA’s Johnson Space Flight Center in Houston and Catherine Corrigan of the Smithsonian Institution, and former UC San Diego chemistry student Kenneth Chong, now at California State Polytechnic University, Pomona, co-authored the paper. Thiemens and Shaheen thank the National Science Foundation’s Atmospheric Chemistry division, which provided partial support for Shaheen’s work on this project. Funding was also provided by NASA’s Mars Fundamental Research program (to Niles), and the Zonta International Foundation and Ohio Space Grant Consortium (to Corrigan).